The good news is one of the best and most underrated films of the Summer, Doug Liman’s surprisingly fun sci-fi tale “Edge of Tomorrow,” is coming to disc with Warner. Bros. Pictures announced an October 7th release date. The disc release comes in 2D and 3D combos, and will feature numerous featurettes and deleted scenes. The bad news is it boasts some of the most awkward cover art of the year, the film’s tagline “Live. Die. Repeat.” dominating the cover with the film’s title tucked away in very small print down the bottom. 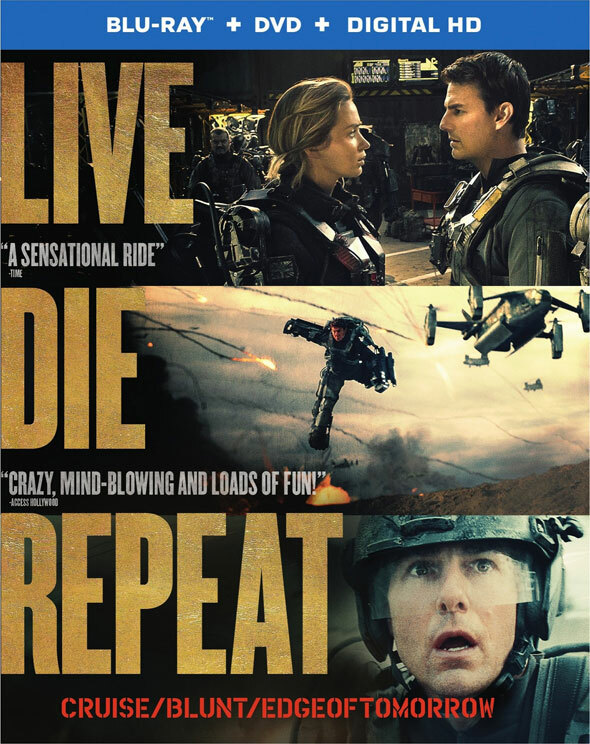 This has already lead to some confusion with the film’s iTunes listing for example calling it “Live Die Repeat: Edge of Tomorrow”. See for yourself. Previous articleHateful Eight Trailer Attached To “Sin City”?